Kristen Macadamia, also known as Miss Mac, reads to her Farrington High School classmates from her book, "The Big Mistake." She has already read to more than 250 students as part of the Kids Talk Story program, which encourages students to explore their experiences by writing and publishing stories. Reading books is good for kids. Writing books has fringe benefits, too. Bao-Yen Nguyen learned the importance of believing in herself at a young age, when her family came to America as refugees from Vietnam. "I have struggled to find myself in the midst of American lifestyle," she said. Nguyen graduates this year as Farrington High School's valedictorian -- proof that staying true to herself was more important than trying to be like everyone else. She shares that self-discovery in her hardcover book, "Fitting In," created in Farrington's Exploration in Education class, through a program called Kids Talk Story. "Kids already have stories to tell and appreciate that someone wants to hear them," said Margaret South, executive director of the program, which was developed through her Learning for a Lifetime company. "Our own passion makes it an interesting story. The most mundane topic can be told in a compelling way." Kids Talk Story guides children as they write, illustrate and publish their own books. South uses a five-step process that teaches character development, encouraging students to write about topics derived from personal experience, to lead them on a voyage of self-discovery. "Life is a series of actions and reactions," she said. "Revealing yourself is the hardest risk." South, co-founder of Bette Midler's All Girl Productions, produced feature films such as "Beaches" and implemented a play-writing program for at-risk students in New York City. She is teaching an intensive course, the Art of Story, at the University of Hawaii and is a volunteer tutor at Aina Haina Elementary School. She brought Kids Talk Story to Farrington through Stephanie Nishihama's class for students who plan to become teachers. 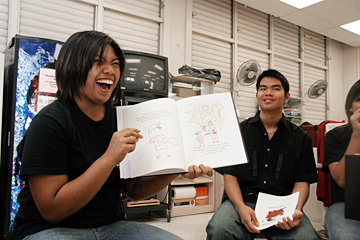 "We want to focus on literacy, especially in the Kalihi area," said Nishihama. The students in the class create lesson plans and work with a mentor teacher three to four times a week at an elementary school. The stories they created were geared toward children in kindergarten to third grade. Nishihama said the book project helped increase their self-confidence, encouraging them to use their imaginations and learn more about the technology of publishing. Those who do not actually become teachers will be better parents thanks to the program, she said. Margaret South, right, executive director of Kids Talk Story, helps Farrington student Enrico Yabut as he learns how to put a hard cover on his book. Marc Kawahara, another Exploration in Education teacher, originally assigned his students to write stories pertaining to social issues or to the elementary schools. Partnering with South to create hard-bound books made the assignment more credible, he said. "Some of the students were very resourceful. If they couldn't come out with their own illustrations, they would find friends who were artists ... or they found a lot of stuff on the computer. ... They were really proud of what they created." The young authors are also required to share their stories with at least 100 younger kids. Nguyen, for example, will read her tale to hundreds of elementary students as a part of the Kids Talk Story program. Kristen Macadamia, also known as Miss Mac, will share her story, "The Big Mistake," which teaches that accidents do happen -- in this instance, a potty mishap. Macadamia practiced reading her book to a group of peers, using facial expressions. She would pause and ask questions to hold her audience's attention. "When younger kids are read to by older kids, it is inspirational," said Mark Loughridge, a Learning for a Lifetime board member. "In any career, we need to be able to communicate with other humans. Ancient forms of communications started with cave paintings -- they tell stories. For kids, stories help them make sense of stuff." South added, "Stories are how we interact with other humans ... at the dinner table, the water cooler, around the campfire. Details trigger certain emotions." Farrington student Renalyn Taylan reads to her class from a book she authored, "Little Bookworms." 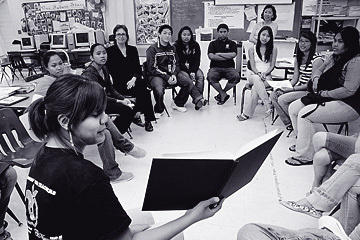 The Kids Talk Story program encourages the high school students to read their stories to younger children as well. Cherryl Gano wrote "Charley, a Monkey Without Faith" -- a message about the importance of self-esteem. "The students are always saying they can't do something. I want them to always try their best," she said. Sandra Irurita used the topic of accepting change. "A lot of the kids have younger brothers and sisters or babies on the way. I want them to accept the change ... to see that it is something better and they have new responsibilities." Renalyn Taylan authored "Little Bookworms." She hopes that becoming a teacher will make her a role model. "I spend lots of time with people, but I love to be around kids." In the beginning, getting teens to open up is not easy, South said. "I look at them, and it takes me right back to when I was 17." The key is to earn their trust by providing a safe environment where there is room for mistakes, she said. "Kids are under a lot of pressure. We need to keep it simple for them. The human-to-human connection is most valuable." Kids Talk Story is not designed specifically for high-schoolers or future educators. In the fall, South plans to branch out to other schools through more coaches and teachers. "Everybody has a story to tell," said South. "When you learn how to write your own story, you learn how to write your own happy ending." For more information: about Kids Talk Story and Learning for a Lifetime, call Margaret South at 277-2503, e-mail info@kidstalkstory.com or visit www.kidstalkstory.com.